It’s a new year! 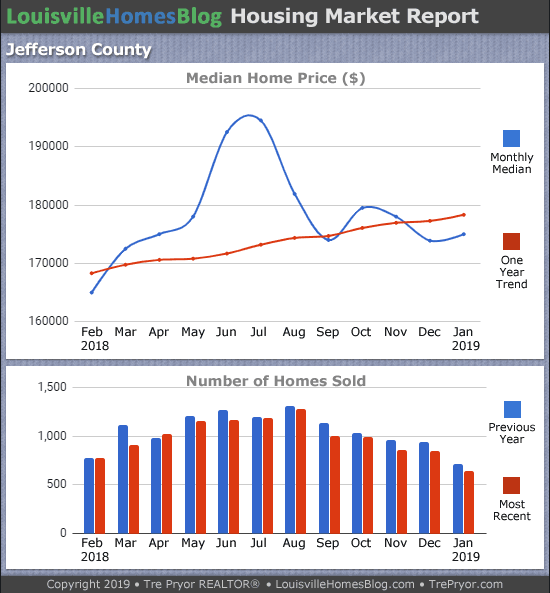 Let’s see how January fared in our Louisville real estate report. 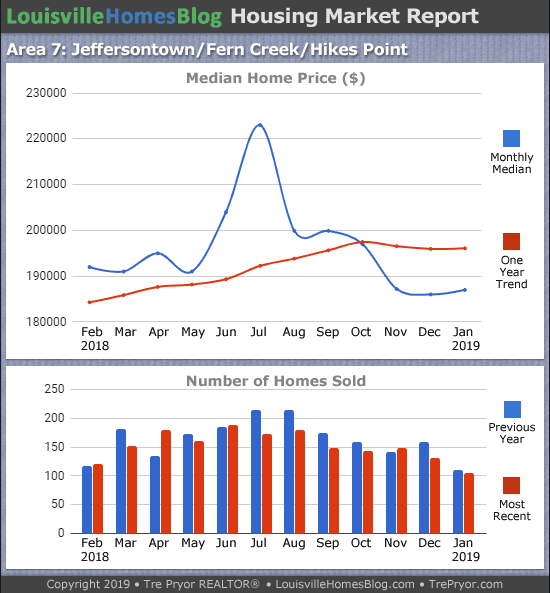 We’ll start with Jefferson County (Metro Louisville) as a whole and then break down our eight monthly MLS areas to see how they performed as well. Sound good? Let’s go! 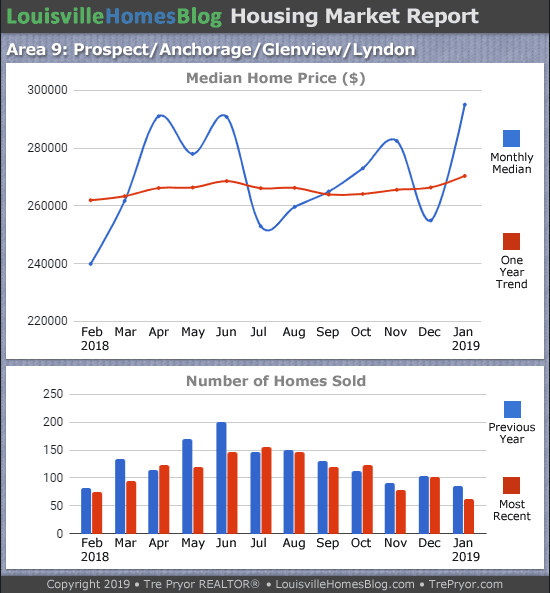 There were 639 homes sold during the first month of 2019. This number is down 9.9% from the previous year. 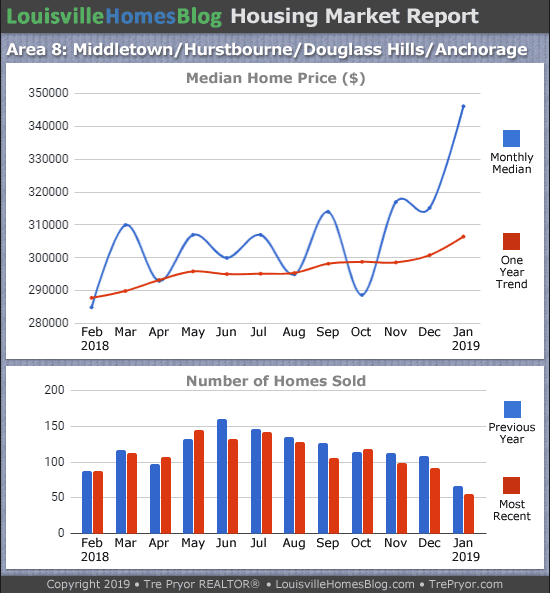 It appears that home inventory in the lower price tiers continues to be a problem for our sales numbers. If we had more inventory, we’d have higher totals. If we turn our eyes to home sale prices things get a little better. 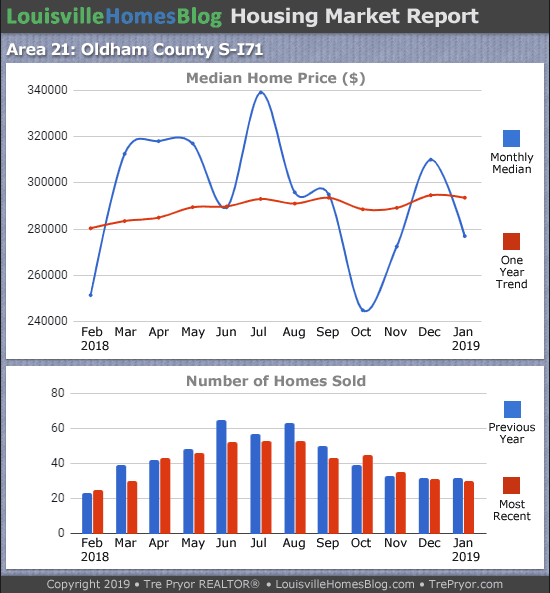 The median sales price during January 2019 was $175,000. Last year that value was just $162,500. That’s good for a 7.7% increase. Not bad. Comparing trend-line values is a safer bet for accuracy. When we do that the increase comes to +6.5%. What we’re seeing now is the same thing we saw last year. 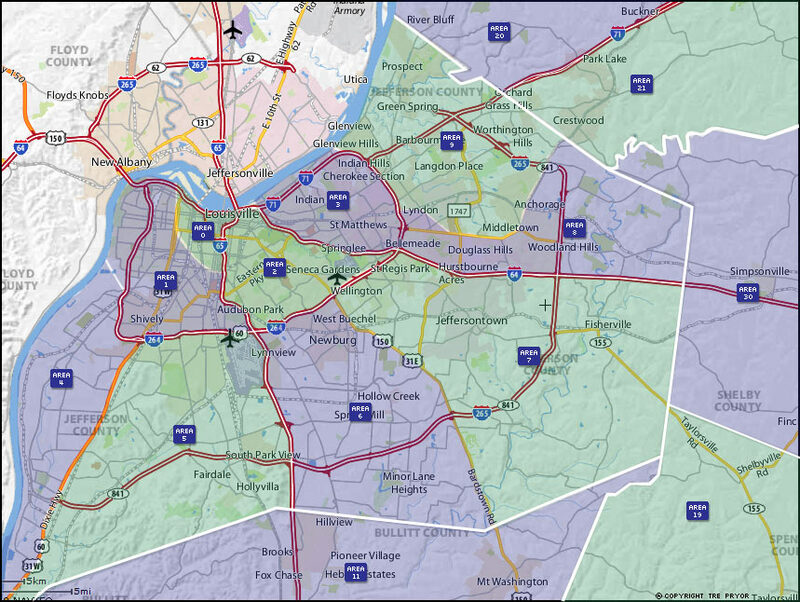 Louisville homes for sale in the lower price tiers are being grabbed up quickly. Homes in the middle are still selling quicker than year’s past. But homes over $400,000 are taking much longer to sell—pretty much the same time as during the past decade. Interest rates actually dropped a bit at the end of 2018 which makes buying a home buying a very attractive investment. Especially when you see how appreciation rates are performing. 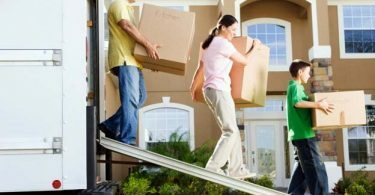 It’s understandable for first-time homebuyers to have concerns, but with Louisville rental rates so high, buying is the smarter choice for those who are planning to be in Louisville for at least 3 years. Our city is divided into smaller MLS areas (see map above) that also give you a snapshot that part of the city. The following are the ones we update each and every month. Home sales in Area 2 ticked higher than the previous year but I’m not liking this downward trend-line on the prices. Since August 2018, we seen it steadily decline. Not good. 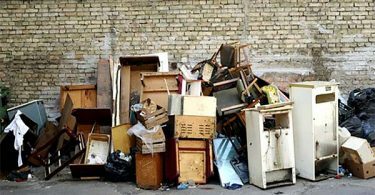 Here we see Area 3 is looking better. Both metrics are moving higher. Typically we don’t see prices rebound during the “off-season” but that’s what’s happening. This area is en fuego! Because it contains lower priced properties, and because those properties are in uber high demand, prices just continue to skyrocket. Any home close to move-in ready and under $200k is selling in the first couple of days on the market. Up until October we saw prices increasing consistently. Since then things have leveled off but that’s somewhat expected. Sales nearly matched the previous year. 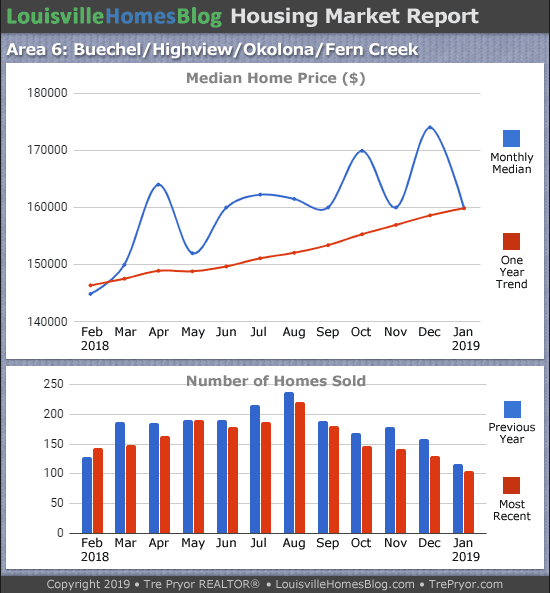 Home sales in Area 8 took a bit of a hit but look at those sale prices! It’s very strange to see such a big jump, especially in the winter. Also with higher priced homes?! I fully expect a downturn in February here. Here we see prices up big as well, which is unusual. 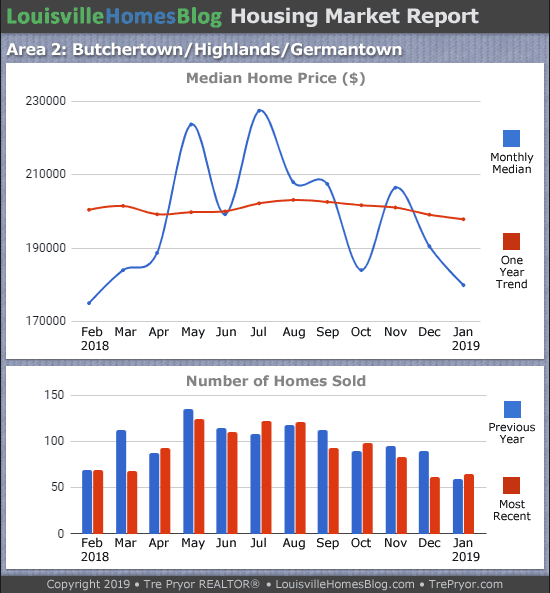 Home sales during January were quite low. North Oldham real estate continues to struggle along. Demand for higher-end new construction isn’t as high as it’s been in recent years. When only 21 homes sell in the entire month, that’s a small number. Things are doing better in Oldham County south of I71. 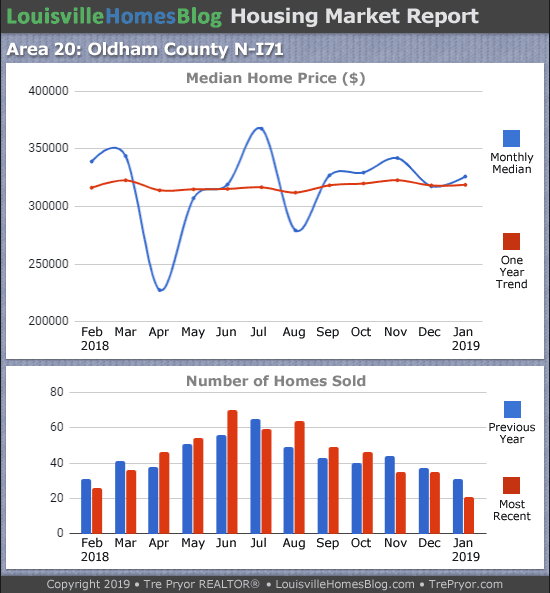 Home prices are only slightly lower but sales have been much better. This and the trend has some upward trajectory to it show the South to be outperforming the North, at least in real estate. 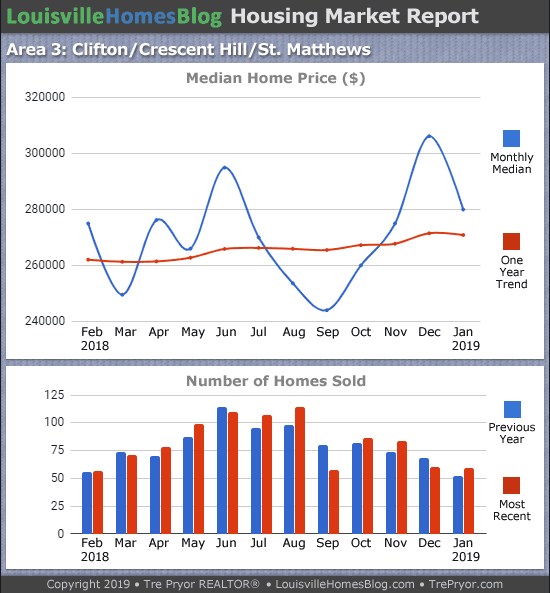 All of the quarterly Louisville real estate reports are now completed thru the end of the year. Check out the links below or find them all in the drop-down menu at the top of each page. 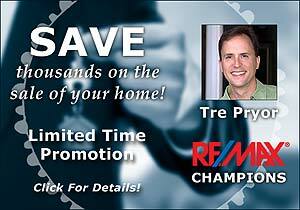 If you’re asking, “What is my home worth?” Please contact me! I’m always happy to help!